Positioned on either side of the spine is an organ called a kidney. But, while most people have two of them, medical research has shown that the body can survive with just one. That is why it is possible for a person to be able to donate a kidney to someone who matches their blood type. In order to compensate for the extra burden, the remaining kidney will simply increase in size over time. The main reason why people need a kidney donation is because they have some type of disease that has damaged their kidneys though Below are some of the symptoms of a kidney disease to look out for. Whenever the kidneys aren’t functioning properly, protein won’t be filtered out of the urine. This will cause a person to notice that whenever they go to the bathroom, their urine will look foamy, like whipped egg whites. That is because the protein has the same albumin in it that egg whites do. For the most part, edema caused by a kidney disease affects the lower legs and ankles. But a person may also notice that the area around their eyes is puffy too, especially if they have had a lot to drink for the day. The extra liquid won’t be able to pass through the body properly, so it will accumulate over time. Unfortunately, the only way to reduce edema caused by a kidney disease is to decrease a person’s liquid intake, which isn’t easy because of the thirst it induces. Decreased kidney functioning causes an accumulation of toxins and waste in the body since they aren’t being carried out of the body through the urine. These toxins make a person feel very tired all the time, so doing even the smallest of tasks will cause them to easily get out of breath. 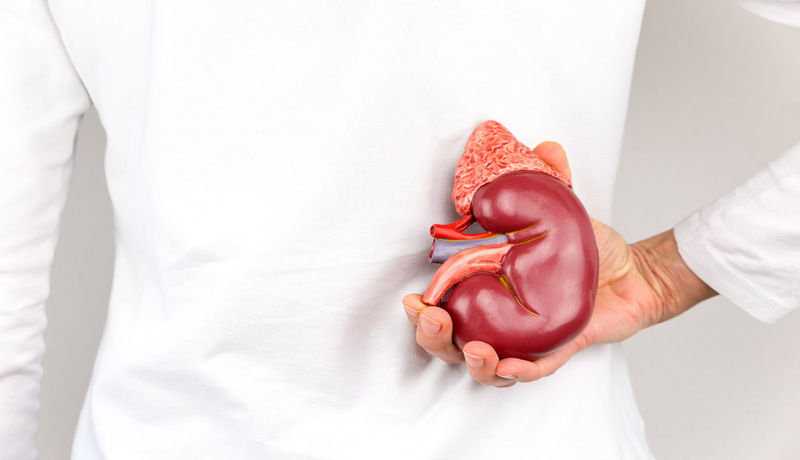 Another reason that breathing becomes harder with a kidney disease is that kidneys help make new red blood cells, which carry oxygen throughout the body. Usually, red blood cells only live for about four months. If they aren’t replaced after this time, a person won’t have enough of them in their body. And this will cause their oxygen saturation rate in the blood to be very low. The kidneys are also responsible for maintaining the fluid and electrolyte balance in the body. And, since muscles need the proper amount of electrolytes to be able to function correctly, a person may get cramps in them whenever the organs are struggling because of a disease. If a person drinks enough water, their urine will be clear. But it will become much darker if a kidney disease is present. Some may even start to see blood in their urine because it is no longer being filtered out by the kidneys. The accumulation of toxins in the body causes vomiting and an upset stomach, which decreases a person’s appetite considerably. This, in turn, often leads to a significant amount of weight loss. So many people who have a kidney disease have to get help from a dietitian if they start to become too thin.